Natural Gas Adapter - Chardon, Ohio-Chardon Metal Products Co. Using our ingenuity, cultivated from decades of experience, at Chardon Metal Products Co. we developed a new approach for manufacturing the gas pipe adapter highlighted here. 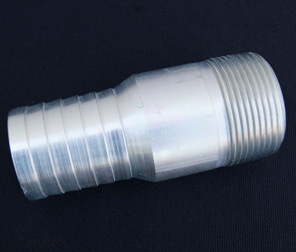 The previous manufacturer used tube fabrication combined with thread cutting to produce this part. Our strategy involved single setup screw machining with thread rolling incorporated right into the process, which ultimately resulted in a faster production rate, higher quality part, and measurable cost savings for the customer. An efficient manufacturing process was essential for assuring accurate, cost-effective production and on-time delivery of quality parts at the rate of 90,000 units on an annual basis. Screw machining is one of our core strengths, and our six-spindle Acme screw machine equipped with a high-pressure coolant system allowed us to achieve exceptionally fast cutting speeds and error-free machining. Replacing the cut threads with rolled threads also offered advantages. The rolled threads produced right on the screw machine were smoother, stronger, and more accurate than the cut threads on the previous product. Our intelligently engineered screw machining process, combined with continuous monitoring and quality control, allowed us to uphold ±0.007" tolerances. Additional operations included zinc plating as a final finish to improve the corrosion resistance for this natural gas pipe adapter. Overall, we produced an extremely high rate of conforming product. In fact, our error rate was 0 PPM, which earned us a Quality Award from the customer. We continue to manufacture this flex adapter in high volume, and provide a Kanban stocking program to ensure immediate, just-in-time delivery to support their Lean manufacturing program. To learn more about this project or how our screw machining expertise can be used to your advantage, contact us today. Rolled Threads (replaced cut threads) Converted Tube fabrication into a screw machine complete part.